One of the most versatile combo amps, yet improved and availible as a 1 x 12 or 2 x 12 combo. 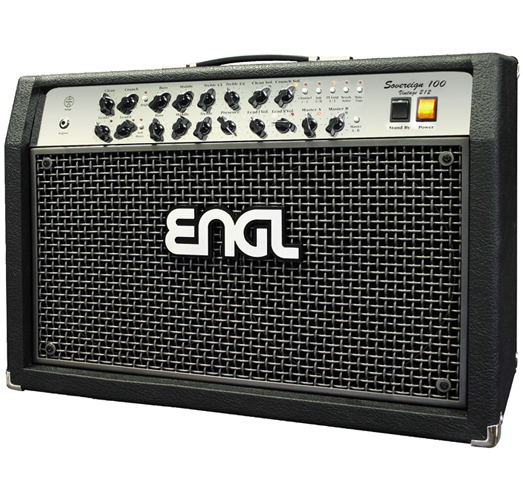 4 channels of finest ENGL tube sounds, switchable via MIDI, wonít leave any doubt that you can take the pure tube tone into small clubs or on the bigger stages worldwide.No compromise craftmanship, equipped with AccutronicsÆ spring reverb and CelestionÆ speakers stress the top of the line quality. Modern punchy bottom end sounds in a handy format ñ still Sovereign! 4 channels- each one with a separate volume control, clean, crunch, soft lead, heavy lead, single 3 stage EQ plus extra crunch treble, 4 stage EQ for lead channels, lead presence, Reverb, bright switch, 5x ECC 83 preamp tubes, Reverb, 2 fx loops (serial to parallel adjustable), built in Noise Gate with threshold control. Channels and sound options Midi switchable. Master A / Master B, 100 watts (1 x ECC83, 4 x 6L6GC power amp tubes), ECS tube protection and power tube monitor system. Balanced Line out- recording compensated with level pot, speaker outs (2 x 4, 2 x 8, 1 x 16 Ohms), fx loop (parallel to serial adjustable), footswitch ports Z-3/Z-4 or custom Z-9 plus MIDI switching via Z-12, Z-15, MIDI IN, MIDI OUT, MIDI THRU, Phantom Power for ENGL Midiboards.